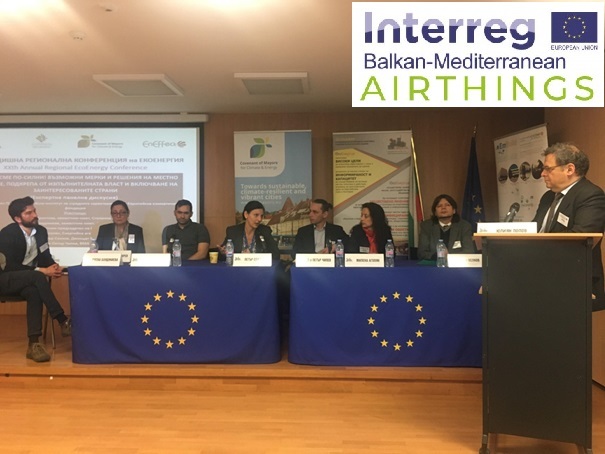 As the Bulgarian Presidency of the Council of European Union is heading to its end, we are proud to announce that during the two international major events dedicated to clean air held in Sofia, the AIRTHINGS project was brought to a significant attention – both of media representatives and stakeholders. The first event - ‘Eco-Innovation for Air Quality’ was held on 5th Feb 2018 in Sofia. The AIRTHINGS project was brought to attention as part of the presentation of the Deputy Mayor on Environment in Sofia Municipality Ioana Hristova. She outlined the Projects mission and purpose and pointed out that IoTs that are about to be provided within the Project were a good example to-be for an innovative decision and a modern approach towards tackling the air quality urban issue. The second event – ‘20th Eco-Energy Conference’ dedicated to energy poverty and air quality was held on 20th of March 2018. The focus of the event was set on air quality and domestic heating. At that event, the Deputy-Mayor on Environment in Sofia Municipality Ioana Hristova again outlined the AIRTHINGS project and put emphasis on the great possibility AIRTHINGS project provides for obtaining chimney filters for domestic heating installations heading towards lower PM emissions.